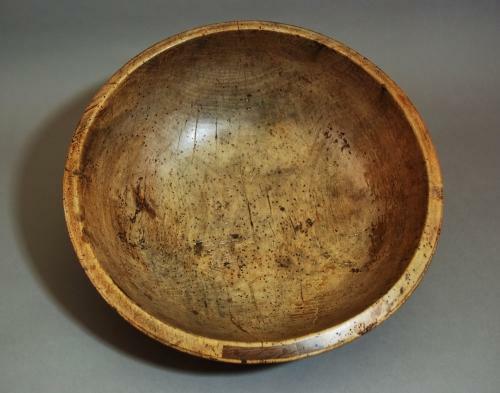 A late 18thc Welsh sycamore dairy bowl of large proportions with superb patina. This piece has a turned line decoration on the outside. This bowl has had woodworm at some point in time, but is not evident now. It has had a repair on the rim (see photograph four), possibly in the 19thc which has been repaired in oak. Sycamore was used for kitchen items as the wood is odourless & therefore has no effect on food. For a collector this is a fine example of a piece of treen.